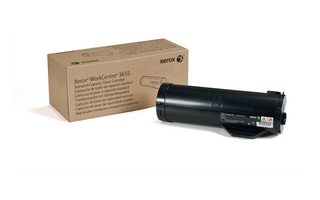 Xerox Black Standard Capacity Toner Cartridge, WorkCentre 3655 (6,100 Pages) for WorkCentre 3655 is specially formulated and tested to provide the best image quality and most reliable printing you can count on page after page. Xerox Genuine Supplies and Xerox equipment are made for each other. Accept no imitations. The WorkCentre 3655 is no longer sold as new.You might like to consider the replacement product. 1 Average standard pages. Declared Yield in accordance with ISO/IEC 19752. Yield will vary based on image, area coverage and print mode. Read our Consumable yields guide (PDF) and ISO Test Reports for more information.